Sold and Shipped by Ever Pretty Garment Inc.
For customer service inquiries or to initiate a return, please contact Ever Pretty Garment Inc. at customerservice@ever-pretty.com or (714) 508-8118. You can initiate a return for new and unopened items within 15 days of delivery for a refund. To qualify for a refund, items must be in new and unused condition with all original materials and/or accessories. If a return is not received at our processing facility within 30 days, it may be subject to a partial refund. You will be responsible for return shipping costs. However, if the return is a result of a fulfillment error, product defect, or damage incurred during shipping, we will refund the full cost of the merchandise. We will provide a pre-paid return shipping label for Non-Buyer's Remorse returns. All returns are subject to inspection, and if found not to be an error on our part, the return shipping costs will be withheld from your refund. SPECIAL RETURNS INSTRUCTIONS: Once the seller approves the returns request, they will provide a Returns Merchandise Authorization. The Seller cannot accept returns for used items. The Seller will issue a partial refund up to 50% for used or non-restockable items. 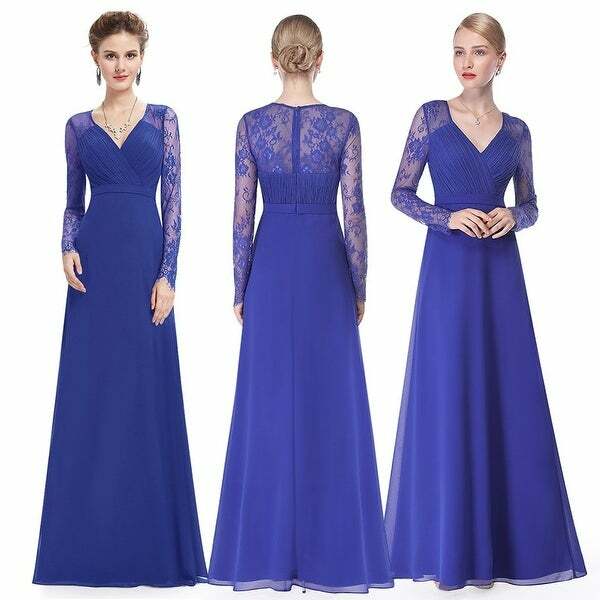 Ever Pretty provide you with all beautiful elegant evening dresses, bridesmaid dresses, ball dresses, princess dresses, coaktail dresses and casual summer dresses. You can find any type of dresses in our shop. And we provide exchange or return within 2 weeks service. If you have any other questions about our dresses or policies, please contact us, we will reply to you quickly. Dimensions 9.0 In. X 13.0 In. X 1.0 In. Elegant dress with long sleeves for a winter wedding.